369 Beacon is located on the south side of Beacon, between Fairfield and Gloucester, with 367 Beacon to the east and 371 Beacon to the west. 369 Beacon was designed by architect George A. Avery and built in 1886-1887 by his father Alden Avery, a builder, for speculative sale. Alden Avery is shown as the owner on the original building permit application, dated November 1, 1886. Alden Avery purchased the land for 369 Beacon on September 29, 1886, from the estate of Francis B. Hayes. The 23 foot wide lot was the western 4 feet and the eastern 19 feet of two 25 foot lots Francis Hayes had purchased on February 7, 1868, from a real estate investment trust formed by John Templeman Coolidge, Franklin Evans, and Charles Henry Parker. The land was part of one of several parcels originally purchased by the trust on January 29, 1866, from the Boston Water Power Company. The trust subsequently subdivided the property into lots, which it sold to investors and builders, who then frequently resold the lots to others. Click here for an index to the deeds for 369 Beacon. On October 18, 1887, 369 Beacon was purchased from Alden Avery by Andrew Birrell Lawrie. He was a widower and his twin sons, Alvah Kittredge Lawrie and Andrew Davis Lawrie, lived with him. They all previously had lived at 480 Shawmut. They also maintained a home in Swampscott. Andrew B. Lawrie and his sons were wholesale linen merchants. He also was a investor in land and railroads. Alvah Lawrie later would become an executive with the Aluminum Company of America. Andrew B. Lawrie died in May of 1888 in San Diego, where he was president of the San Diego Land Company. After his death, Alvah Lawrie moved to San Diego and Andrew Lawrie moved to Swampscott. During the 1888-1889 winter season, 369 Beacon was the home of retired cotton buyer and dry goods merchant George Wellman Wright and his wife, Georgianna (Buckham) Wright. They previously had lived at 321 Dartmouth, and moved back there by the next season. On September 23, 1889, 369 Beacon was purchased from Andrew Lawrie’s heirs by sisters Ada Forbush, Josephine Forbush, and Maria Forbush. They previously had lived at 82 Charles Street, which had been the home of their parents, shoe and boot merchant Edward W. Forbush and his wife Mary Josephine (Faxon) Forbush. Josephine Forbush married in February of 1894 to Samuel Johnson, II. After their marriage, they lived at 393 Beacon. On June 27, 1894, she transferred her interest in 369 Beacon to her sisters. In April of 1895, Ada Forbush married William Faxon, Jr., a lawyer, and 369 Beacon became their home. They continued to live there in 1907. They also maintained a home in Cohasset. Maria Forbush lived with them at 369 Beacon and in Cohasset until her marriage in June of 1905 to George Badger Dewson, a real estate trustee and Harvard classmate of William Faxon, Jr. After their marriage, the Dewsons lived at the Hotel Royal at 295 Beacon and in Cohasset. On August 7, 1907, 369 Beacon was purchased from Ada Faxon and Maria Dewson by Harriet L. (Jones) Foster Eaton, the wife of Francis Storer Eaton. 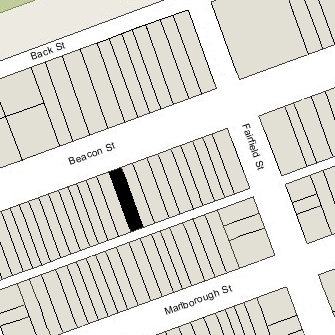 They previously had lived in an apartment at 224 Marlborough. They also maintained a home in Westport, Maine. Living with them was Olive Tennyson Foster, Harriet Eaton’s daughter by her previous marriage, to Horace Tennyson Foster. During the 1909-1910 winter season, the Eatons and Miss Foster were living elsewhere, and 369 Beacon was the home of George Hastings Swift and his wife, Lucile Darst (Casey) Swift. They had lived at the Hotel Somerset in 1909. He was the New England representative of his family’s meat packing firm, Swift & Company. By the 1910-1911 season, the Swifts had moved to 148 Commonwealth and 369 Beacon was once again the home of the Eatons and Miss Foster. The Eatons and Miss Foster continued to live at 369 Beacon in 1925. In April of 1925, Olive Foster married Cyril Lewis Norton Newall of the Royal Air Force. He served as Chief of the Air Staff during the early years of World War II and then as Governor-General of New Zealand from 1941 to 1946. He was created First Baron Newall in 1946. The Eatons continued to live at 369 Beacon during the 1925-1926 winter season, but moved thereafter to their home in Westport, Maine. On November 29, 1926, 369 Beacon was purchased from Harriet Eaton by Mary (Crane) Johnson, the wife of Rev. Herbert Spencer Johnson, a Baptist minister. They previously had lived at 164 Bay State Road. In December of 1926, the Johnsons applied for (and subsequently received) permission to remodel the third and fourth floors of the house. During the 1926-1927 winter season, while the remodeling was being done, they lived at 83 Marlborough. During the winter of 1928-1929, the Johnsons were living elsewhere and 369 Beacon was the home of attorney Henry Eldrige Warner and his wife Henrietta (Slade) Warner (the 1929 Blue Book entry indicates that the Warners would be there until May 1, 1929, and the Johnsons would be there after May 1). In 1928, the Warners had lived at 253 Commonwealth. They also maintained a home in Lincoln, which became their primary residence in 1930. 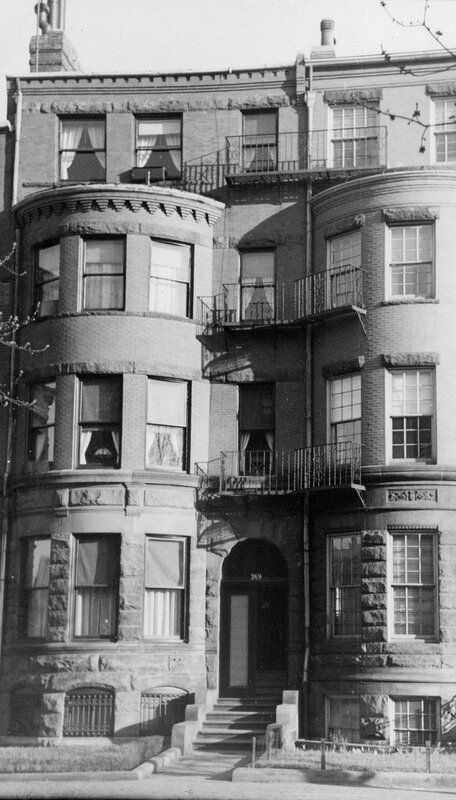 The Johnsons continued to live at 369 Beacon during the 1929-1930 winter season, but moved thereafter to Brookline. On August 21, 1931, 369 Beacon was purchased from Mary Johnson by mortgage broker Herman A. Train. 369 Beacon was not listed in the 1931-1933 Blue Books and was shown as vacant in the 1931-1933 City Directories. The property changed hands and on May 2, 1932, was acquired by Thomas Bradbury McAllister and his wife, Sarah (Sadie) Maude (Scott) McAllister. Lillian M. (Eaton) Goodwin, widow of William S. Goodwin, lived with them. They all previously had lived in Whitman. Thomas McAllister was Secretary-Treasurer of the Eastern States Mining & Smelting Corporation. They continued to live at 369 Beacon during the 1935-1936 winter season, but moved thereafter. By 1940, they all lived in Brookline. 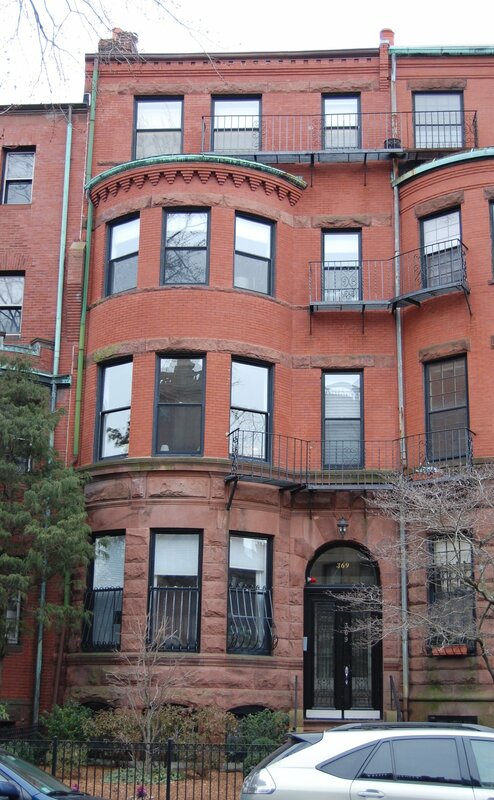 On November 13, 1935, the Massachusetts Hospital Life Insurance Company foreclosed on its mortgage on 369 Beacon and took possession of the property. The house was not listed in the 1937 Blue Book. On May 15, 1936, 369 Beacon was acquired from Massachusetts Hospital Life Insurance by John J. Kelly and his wife, Catherine C. (Farren) Kelly. That same month, he applied for (and subsequently received) permission to convert the property from a single-family dwelling into a lodging house. John Kelly died in April of 1947. Catherine Kelly continued to live at 369 Beacon (and operate it as a lodging house) until about 1950. On May 5, 1950, 369 Beacon was acquired from Catherine Kelley by attorney Henry H. Davis and his wife, Virginia Mildred (Nason) Lyons Davis. They lived at 415 Beacon. On July 1, 1953, 369 Beacon was acquired from Henry and Virginia Davis by Vincent J. Campbell and his wife, Betty Aileen (Heath) Campbell. They previously had lived at 181 Bay State Road. In August of 1953, they applied for (and subsequently received) permission to convert the property from a lodging house into two apartments and a lodging house. They lived in one of the apartments. On November 25, 1955, Vincent and Betty Campbell transferred 369 Beacon into Betty Campbell’s name. They separated at about this time and Betty Campbell continued to live at 369 Beacon. In May of 1969, she also acquired 365 Beacon. Betty Campbell died in June of 1992. 369 Beacon was inherited by her daughter, Susan Aileen Campbell. On May 27, 1993, Susan Campbell, as executrix of her mother’s estate, transferred the property to herself as trustee of the 369 Beacon Trust. Susan Campbell died in May of 2002. At the time of her death, she was the wife of Arthur Michael Borden, who succeeded her as trustee of the 369 Beacon Street Trust. On August 12, 2002, 369 Beacon was purchased from Arthur Borden by the Madeira Isle Real Estate Corporation, (Daniel Silva, president and treasurer). In October of 2002, it applied for (and subsequently received) permission to convert the property from two apartments and a lodging house into four apartments. On November 14, 2003, it converted the property into four condominium units, the Heatherdene Condominium.